LEFT: Nicklas Lidstrom signs the chopper. 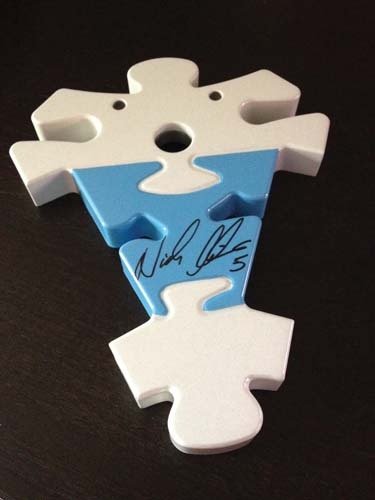 RIGHT: Lidstrom’s autographed puzzle piece. After completing the bike last fall, Walendowski and his chopper, which sports a jigsaw-puzzle piece design, joined the efforts of the Ted Lindsay Foundation. The organization, named for its co-founder (the Red Wing great) is dedicated to elevating autism awareness nationwide. Fellow co-founder John Czarnecki has a son with autism. 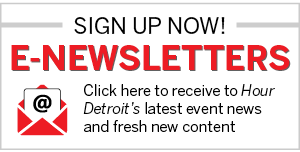 Since joining forces with Lindsay’s group, Walendowski and the chopper have been making appearances at various Detroit events, including the North American International Auto Show and Detroit Belle Isle Grand Prix. On Sept. 17, the bike will be signed by several Detroit Red Wings and other Detroit celebrities at the Foundation’s 12th Annual Celebrity Golf Outing. Those autographs will join those of Pavel Datsyuk, Nicklas Lidström, Ted Lindsay, and Gordie Howe, who have already autographed the cycle.